de Sarthe Project Space is pleased to present Michal Martychowiec’s first solo show entitled ‘Sous les pavés, la plage !’ at the gallery. The exhibition will open on 16th July starting from 4:00 p.m. and on view through 13th August, 2017. Sous les pavés, la plage ! (Under the cobblestones, the beach!) was one of the slogans used in France’s 1968 demonstrations. It expressed the desire that beneath the city which had been hardened by stone, there is the freedom of the beach (represented by the sand on which the paving stones were placed). Beneath this poetic phrase of the past lay an actual brutality and anger of the French fighters for freedom and all the pre-1968 ideals which have never quite played out. 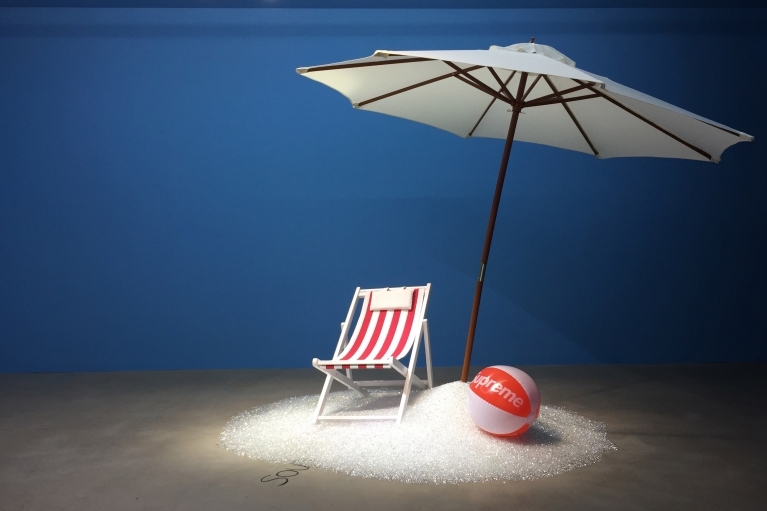 In a simple gesture of installing a beach the work summons heritage of the 20th-century failure (with which we are yet to deal properly) and assembles it with characteristics of the contemporary societies of global liberal capitalism. Tutto inizio in un giorno di violenza (it all begun on a day of violence) is the first line of the contemporary paraphrase of the Iliad written by Alessandro Baricco during the time of the war in Afghanistan. This phrase in the direct contemporary language sums up the problematics of the original story, for the Iliad (the very first book of the Western civilization) does not begin with chapters of love between Helen and Paris, but with the raging war. The two works originally created to function as part of other projects, now together, they construct an even more complex narrative. This is the typical method the artist takes in constant re-developing his work. At first he creates mix media installations concentrated on more narrow specific ideas, to then to broaden their significance through compilation of several narratives (chosen elements of other individual projects) into a multi-parallel one. The newly created significance of individual artworks and its symbolic functioning throughout the artist’s oeuvre both have to be considered. The work which was to be looked at from the front in another installation, might reappear turned with its back and one could say it is thus developed through with the quality which Feuerbach once called Entwicklungsfähigkeit – something holding a capacity to be developed. Sous les pavés, la plage ! commits a certain reversal of the meaning. At the level 0 there is concrete pavement, that’s the point of perspective, under the pavement should be the sand of the beach, symbolizing freedom and nature. The sand is thus taken from underneath and placed on the top, with such difference the sand is no longer natural but industrially produced and thus we end up with crystal, common and without value like the sand in fact, yet for some strange reason valued by us. We thus find this new beach very beautiful, it certainly attracts us. It perhaps reminds of the peaceful holiday time we spent at the seaside but here is where two discomforts might occur (which nevertheless would be ignored while the blink blinds and attracts us): 1. the crystal beach on the concrete pavement as much as beautiful is even more artificial, bur the true artifice is in. 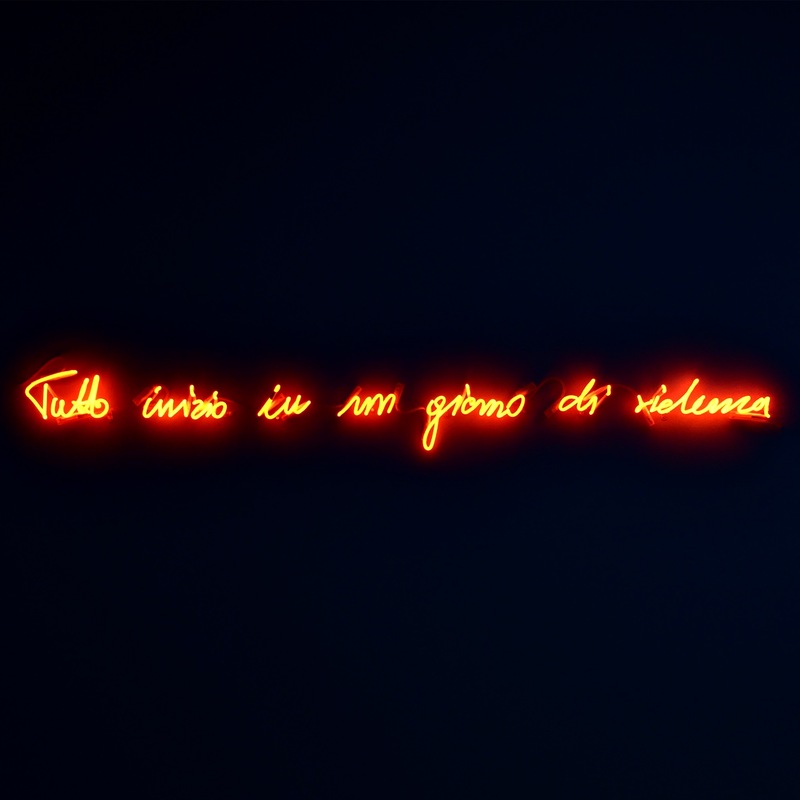 2. the neon, which points to the violence, violence which lays at the base of every beginning, but which in this case cannot be clearly seen under the cover of beauty. This contemporary violence is docile, it lays in the act of creating a docile pacified man who will devote himself to what might be attractive, yet fruitless and passive activity. In a way, both works inform one another. As the violence is not apparent in the crystal beach so the artificial is not visible on the surface when one considers the neon work. 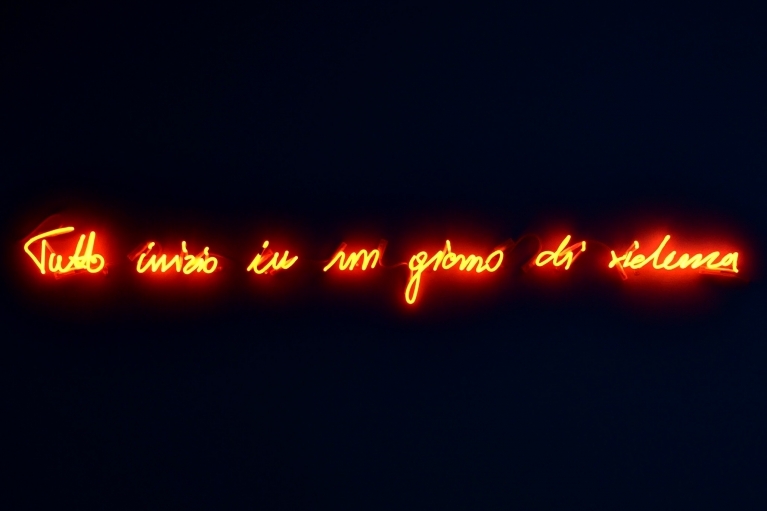 This quality of the artificial though, plays a crucial role in the project Empty room of which the neon is the opening work. In there however, the violence is placed in the existential context of contemporary communication, drawing the story throughout the digital, AI, history and the physical. For more information about Michal Martychowiec, click here.